Prof Jarman: REALLY an ‘independent’ expert on NHS mortality stats? Professor Brian Jarman—[Interruption.] I think Opposition Members might want to listen to this, because it is what independent people are saying. Professor Jarman, who invented hospital standardised mortality indices, said that “the problem was ministerial pressure, even from Number 10. It turned out that Hunt was misleading in his claims of ‘ministerial pressure’ by Labour throughout his statement, as this article by Shibley, and the letter he reproduces from Baroness Young, show. 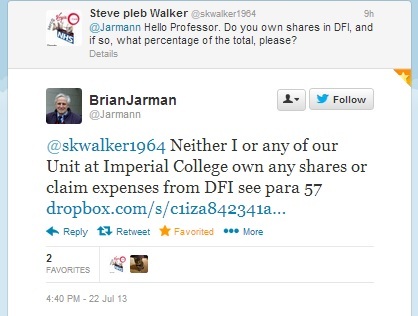 But was he right in describing Professor Jarman as ‘independent’? He’s certainly right in implying that the Professor’s credibility on the issues surrounding hospital mortality depend on it, as any conflict of interest on the matter should render his ‘expert opinion’ inadmissible. I’ve criticised Professor Jarman, the creator of the ‘HSMR’ statistical system for measuring NHS mortality, on a number of occasions for his apparent support of misleading media claims of ‘needless NHS deaths’, whether on Mid Staffs, on Leeds children’s heart surgery unit, on the 14 NHS Trusts investigated by Bruce Keogh, or on the NHS generally. But I’ve read his motivation as centering around his emotional desire to defend his statistical ‘baby’, leading to an apparent agreement when interviewed by the media about ‘needless’ NHS deaths, even though his comments on Twitter have occasionally admitted that HSMRs are, at best, a prompt to “check if something’s going wrong”, which is also what he told the Francis inquiry. Hospital Standardised Mortality Ratios, or HSMRs, have been replaced by the SHMI (Summary Hospital-Level Mortality Indicator) as the official measure of NHS hospital mortality, primarily because HSMRs only include a proportion of hospital deaths and do not include deaths within 30 days of discharge, which can lead to distorted mortality rates. HSMRs, which are promoted by a commercial Doctor Foster Intelligence (DFI), also face competition from the RAMI (risk-adjusted mortality index) promoted by a rival company, CHKS. It would be understandable – though wrong – for Professor Jarman to want to enhance the perception and acceptance of his ‘baby’. DFI delivers alerts to hospitals which participate in its programme if they are suspected to have excessive mortality rates, and publishes a ‘Good Hospital Guide’ ranking hospitals by its assessment of their performance on patient mortality. As one of its directors, Roger Taylor testified to the Francis inquiry, DFI charges NHS Trusts some £35,000 a year (2011 prices, perhaps higher now) for its services. Since there are around 140 NHS Trusts in England, this represents a potentially huge and profitable business. However, I have also obtained additional information that makes the situation considerably less clear-cut. DFI is part owned by the Department of Health. The balance is owned by a ‘holding company’, Dr Foster Holdings LLP (DFH). An ‘LLP’ is a ‘limited liability partnership’ – a company which any number of partners co-own, but without the unlimited ‘joint and several liability’ of ordinary partnerships. The risk for the partners is limited in a similar way to that of shareholders in a limited company – and the partners share directly in any profits of their partnership company. Dr Julian William Ernest Jarman is a director and ‘LLP Member’, or partner, in DFL. Julian Jarman is Professor Brian Jarman’s son. The professor is interviewed regularly by the media, used by official investigations such as Bruce Keogh’s, and referred to by the Secretary of State for Health, as an ‘independent’, impartial expert in NHS mortality statistics – and presented to the public as such. But in light of this new evidence, can a claim to impartiality be considered credible? Im not Brian Jarman’s biggest fan but this is so lame. CoIs dont necessarily render evidence inadmissible. They demand that special scrutiny be given to those claims. Oh, you’re back. What joy. And where IS that special scrutiny, then? Before reading this, please note that the findings in this article are NOT conclusive, nor are they presented as such. They raise serious questions about the independence of an ‘expert’ who has dragged Labour into disrepute, but further proof is needed before any direct assertions may be made. 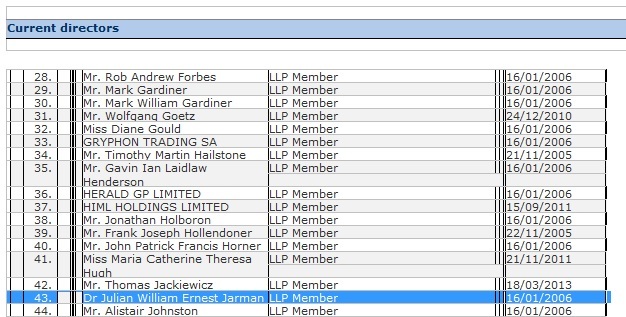 In fairness, if Prof Jarman does have financial links to Doctor Foster, and through them, to the Department of Health, now’s the time to admit it. Presumably you could re-ask him, with “Do you own” replaced by “Do you, or any members of your immediate family, own”. That’s been asked now, by someone else. But it’s on the record that his son does, so it’s moot, really. I sent a general brief email question to the DWP about when they expected an update on the previous ‘Deaths of Recipients’ but received an answer from the IGS Fredom of Information Team! It concludes that in future I should ‘…go to the GOV.UK site…’ . I am relatively new to blogging but thought a full copy of the Q and A might be interesting for you and others to take a look at, but I’m not sure of the protocol to submit the emails to you. Jake Arnold-Forster who has a finger in a lot of pies some of which are private healthcare related. Check out this link to one of those companies called COBIC Solutions which he helped set up since the new Health Bill came in. The little video on the page linked to sounds like it could have been scripted by Jeremy Hunt. Yes, I’ve done a little digging on some of the others and they’re interesting – but you’re ahead of me!